Nestled in the heart of Manhattan, the Central Park Zoo is an oasis of exhibits specifically adapted to meet the needs of its inhabitants. Considered to be New York's "newest, oldest" zoo in the state, Central Park Zoo attracts almost a million visitors a year. The latest addition to the park is the Tisch Children's Zoo, which specializes in events specific to small children. The Zoo is also divided into three main sections geared toward inhabitants of different regions, these being the Polar Zone, the Tropic Zone, and the Temperate Territory. Central Park Zoo prides itself in its ability to educate children in a hands-on fashion. At the Tisch Children's Zoo, children are able to hand feed domestic animals such as sheep and cows, as well as a special pot-bellied pig. This area also includes an amazing jungle gym that is designed in the spirit of bugs. Children are able to climb around on a giant spider's web within the jungle gym, while life sized statues of animals make it easy for children to put animal sounds with the face they belong to. These exhibits are particularly helpful to young children because they learn best when information is presented in unique forms. The Acorn Theater located in this area also provides children's educational opportunities in a fun way. Here, families can enjoy daily shows that inform, educate, and entertain guests about the natural world. Bundle up because it's cold inside the Polar Zone at the Central Park Zoo. This arctic paradise is home to some of the world's most exciting cold weathered friends. Guests to the Polar Zone are especially excited to see the Polar Bears. Children and parents find it hard to resist the playfulness of Ida and Gus. These polar bears continue to amaze year after year. From swimming in the icy waters to playing around on the rugged terrain, there is always something exciting to witness. Along with the Polar Bears, the Polar Zone is also home to an arctic fox, a harbor, and a variety of penguins during their visit. The Central Park Zoo realizes the importance of beautiful birds and creepy crawlers to our ecosystem. Therefore, the Tropic Zone has become home to some of the most magnificent tropical birds in the land. Birds who are brilliant in color, like the African pygmy goose and the Scarlet-chest parrot, are in high demand with zoo visitors. The brilliance of color is sure to keep the kids wanting to ask and learn more. Don't forget the frogs, lizards, and snakes found here that are sure to excite any boy - and a few girls, too! 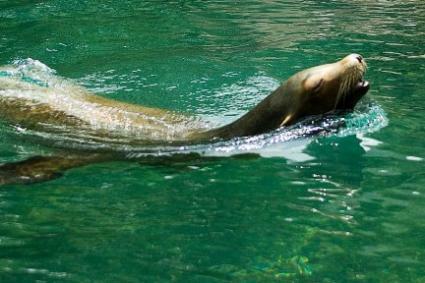 The stars of the Temperate Territory at the Central Park Zoo are the California sea lions. In their tank, which is a huge focal point of the zoo, guests can enjoy watching the three female sea lions. In fact, visitors to the zoo are often entertained with impromptu sea lion shows while visiting this area. Children are able to see firsthand what really makes these creatures tick. With arms flapping and sounds galore, it will be hard for children not to giggle and laugh at the excitement of the sea lions. The latest café at the Central Park Zoo has introduced the zoo-goer to a menu that is rich in flavor and nutrition. In addition to a "normal" menu, guests are able to make selections from an extended menu that includes all natural and organic ingredients. Are the kids craving a PB&J? Try a sandwich with organic peanut butter. The café fits in perfectly with the zoo's goal, which is to promote healthy eating along with environmental conservation.